In order to improve maritime safety conditions at sea and on shore, the International Maritime Organization (IMO) adopted mandatory amendments to the International Convention for the Safety of Life at Sea (SALOAS). These amendments, which will become effective on 1 July 2016, have the purpose to obtain an accurate gross weight of a packed container prior to loading aboard the ship. The IMO has issued Guidelines which were intended to established a common approach for the implementation and enforcement of the SOLAS requirements regarding the verification of the verified gross mass (VGM) of packed containers. The purpose of this document is to provide guidance on complying with the rules and implementation of the SOLAS container weight verification requirements. 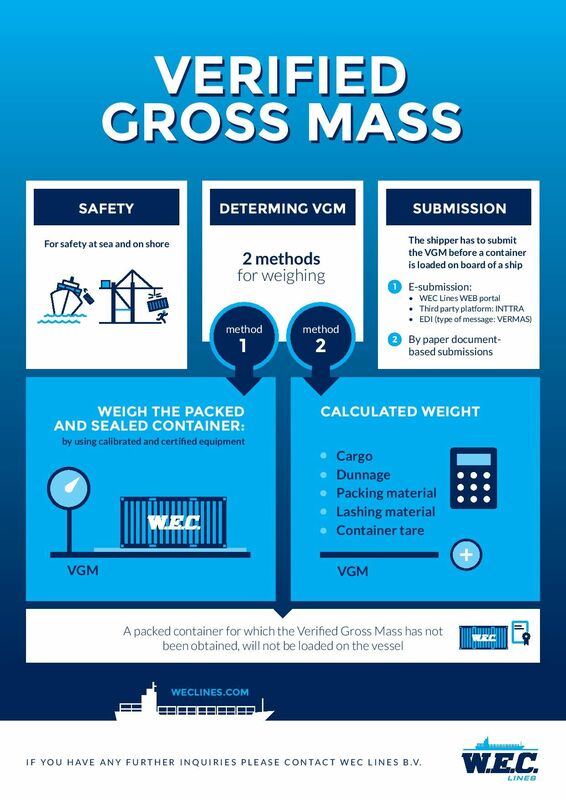 The SOLAS requirements to verify the Verified Gross Mass (VGM) is applicable for all packed containers to which the Convention of Safe Containers (CSC) applies. A container presented for export shall not be loaded onto the ship unless W.E.C. Lines local agent have obtained, prior to vessel loading, the Verified Gross Mass of the container. Any eventual extra costs such as weighing. terminal handling charges, haulage, demurrage, fines, stores or repacking of the container resulting from, non-timely or non-submission of the Verified Gross Mass (VGM), will be for account of the shipper. The responsibility for obtaining and documenting the Verified Gross Mass (VGM) of a packed container lies with the shipper. According the SOLAS the shipper means a legal entity or person named on the bill of lading or sea waybill or equivalent multimodal transport document as shipper and/or who (or in whose name or on whose behalf) a contract of carriage has been concluded with W.E.C. Lines B.V.
After packing and sealing of the container, the shipper or a third party may weigh the packed container, using calibrated and certified equipment. Method 2 is inappropriate for certain types of cargo such as bulk cargo and flexitanks, for such cargoes method 1 must be used. Estimating the weight of a container's content or container tare is not permitted. The shipper shall use the tare eight indicated in the container or which will be provided by W.E.C. Lines, if available. The shipping document can be part of the shipping instructions. The document should clearly highlight, per container, that the gross mass provided is the 'Verified Gross Mass'. The Verified Gross Mass (VGM) should be mentioned in kilograms or pounds, depending on which measure is used in that jurisdiction. The document declaring the Verified Gross Mass (VGM) of the packed container should be signed by a person duly authorized and empowered acting on behalf of the shipper. The signature may be an electronic signature or may be replaced by the name in capitals of the person authorized to sign it. WEC E-Business portal - VGM (Web portal): Submission of single container data or excel import for multiple containers. A VGM cut-off time will be set, allowing W.E.C. Lines or their local agents to submit the VGM to the vessel planner and Stevedores. The cut-off time will be informed locally by our agents as this may difference per Stevedore and/or port of loading.